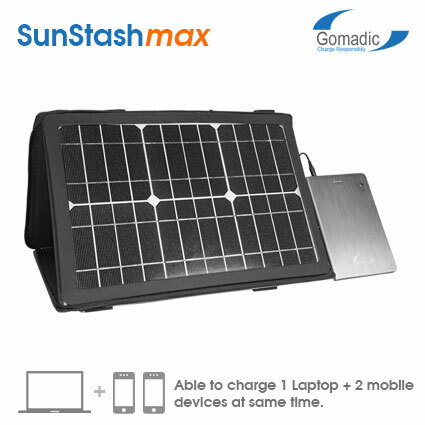 SunStash Max provides 2 methods to charge your electronic devices. 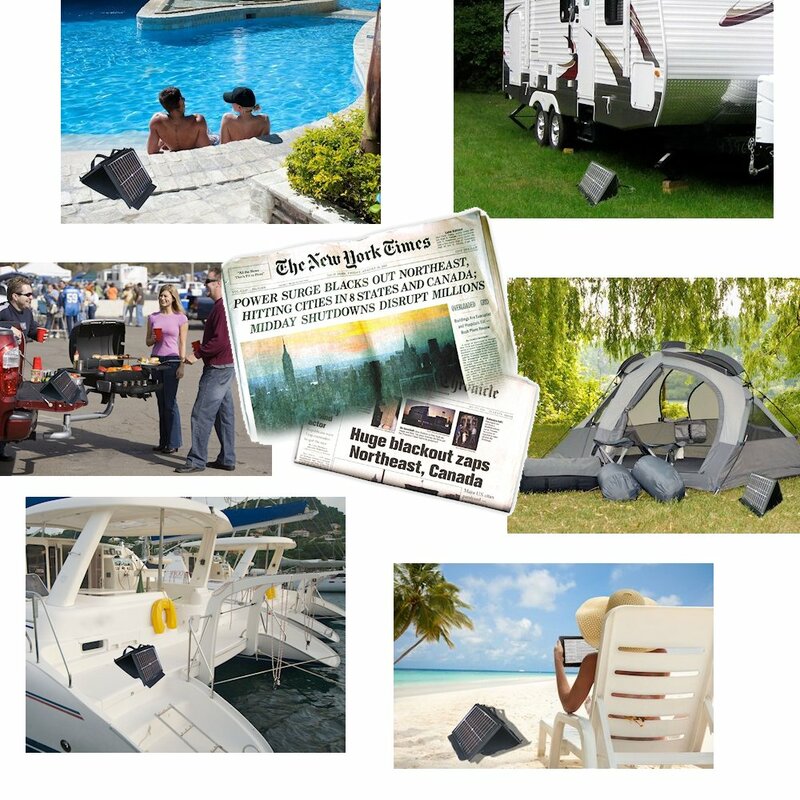 One method is for the front facing solar panel to gather power from the sun which is stored in a high capacity 60W battery pack which can be used later to charge your device(s) including laptops. The battery pack can also be charged via the included AC outlet charger. 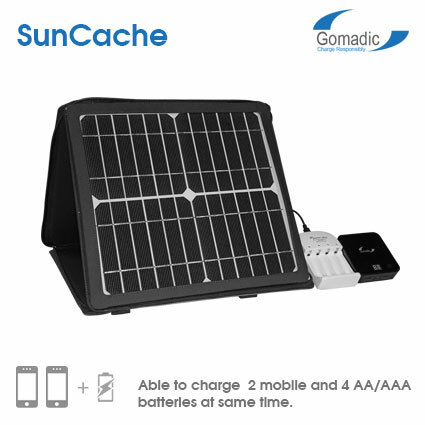 Our most powerful SunStash platform, the SunStash MAX Solar Charger uses sunlight to charge all your mobile electronic devices (and even a laptop too!). 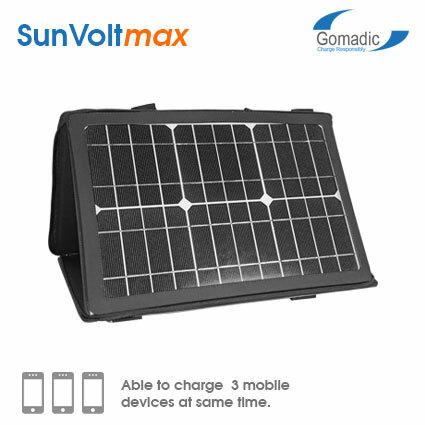 Boasting our most powerful monocrystalline solar panel, a lightweight water-resistant carrying case and a powerful 60W Lithium Polymer rechargeable power pack, the SunStash MAX Solar Power Charger means you'll never lose power again, even when you're off-grid for extended periods of time. Panel Solar panels are based on the powerful and very efficient 15W Monocrystalline photovoltaic technology. 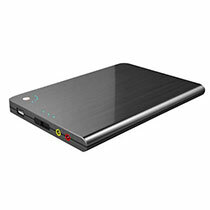 A 60W (16,000mAh) power pack is used which is amazingly flexible. 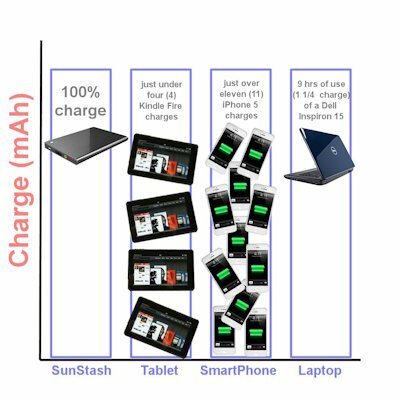 Despite being powerful enough to charge all your Gadgets (smartphones, dumb phones, MP3 players, GPS receivers, etc), it also has a high powered port that can charge higher voltage devices such as Laptops and 12v vehicle accessories that you already own (via the included Power Port Adapter). It can even charge two gadgets or a gadget and a PC at the same time! 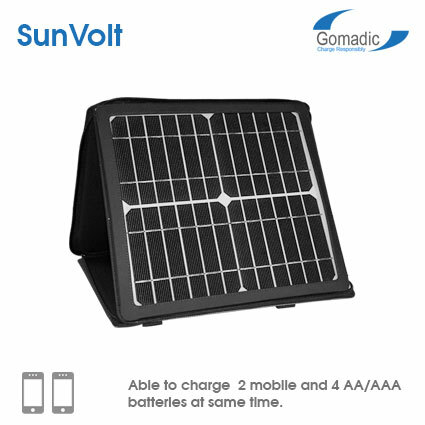 The storage pack can be charged by either the solar panel or via a traditional wall outlet using the included AC wall adapter. 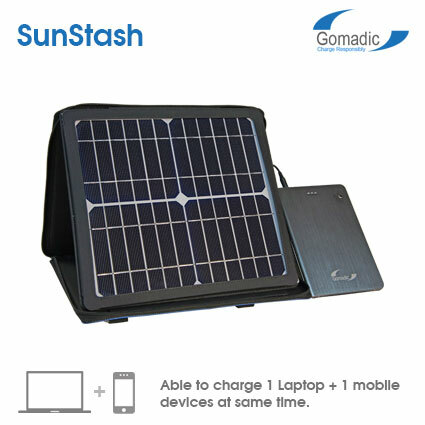 The SunStash uses a powerful front facing solar panel to charge one of a 60W portable battery cache. 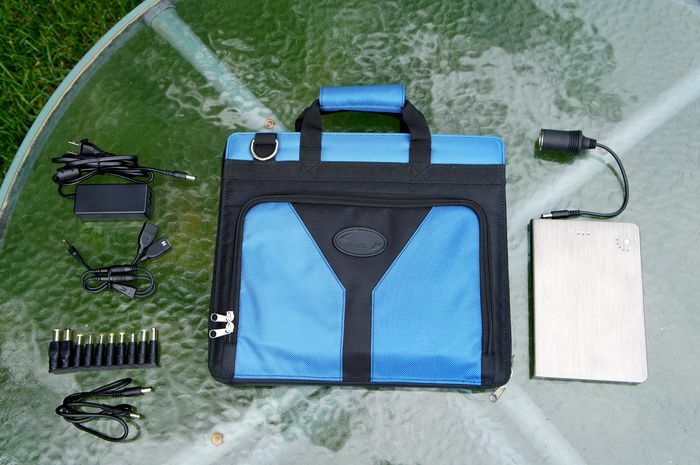 The portable power pack cache can then be used to charge a variety of devices from smartphones to laptops. For sunless days, the battery cache can also be charged via the traditional power grid using the included AC adapter cable. 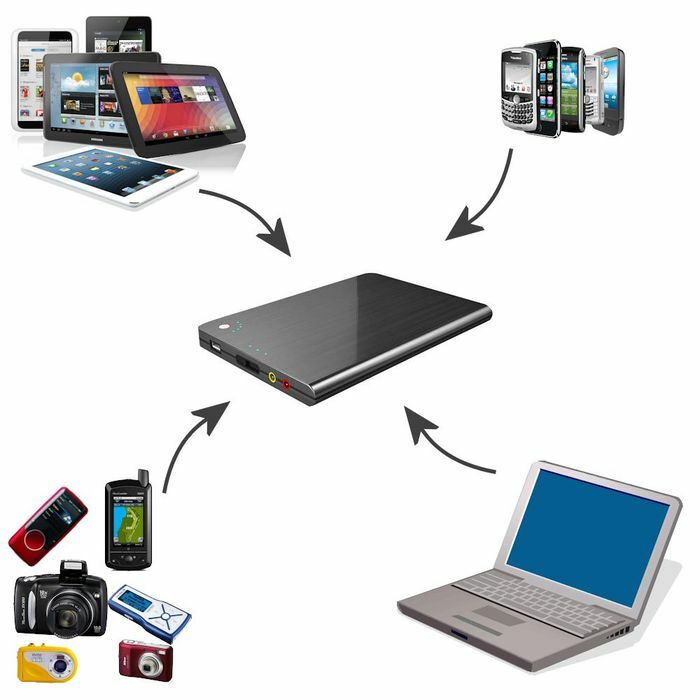 Devices Supported Customer electronic gadgets that use 5v/12v/16v or 19v of power including smarthpones, GPS, MP3, tablets, laptops and more! 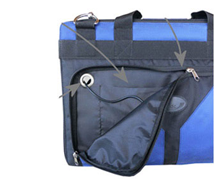 A robust lightweight carrying case houses each SunStash Max system. The case's outer shell is made of high quality, 1680 densely stitched Ballistic Nylon, which provides a durable and water resistant surface. 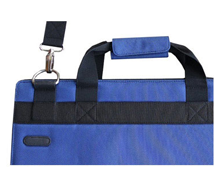 Its padded and rigid inserts both protect and cushion the panel as well as any other inside contents, which you might be carrying. 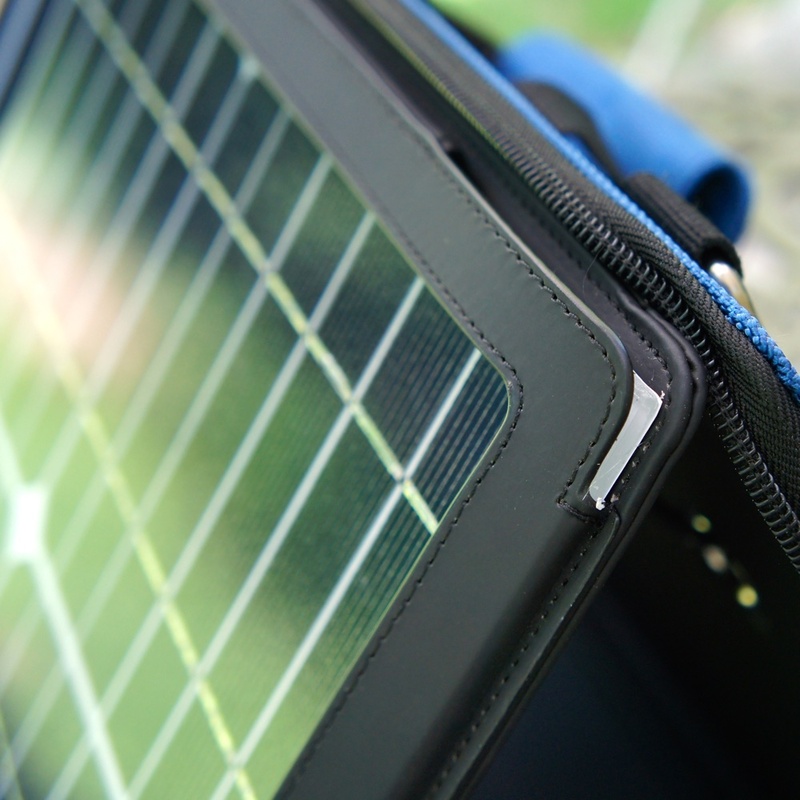 The SunStash Max's solar panel is held in place by a hinged, rigid inner shell that easily folds out and fits into one of several angle adjuster slots. This means you can change the panel's position based where the sun is when you need to charge. 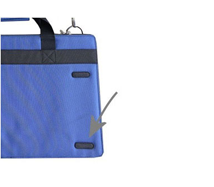 Use the case's large accessible front pocket to store both charging cables and devices, multiple smartphones or most tablet-sized computers. 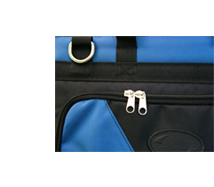 Inside the front pocket you'll find additional compartments for better organization and storage. The SunStash Max case's exterior has four Neoprene non-slip pads that keep the panel from slipping or shifting while you're charging. 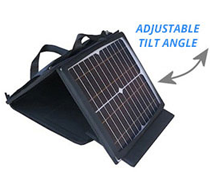 A durable twill weaved handle and sturdy steel loops for an optional shoulder strap offer two ways to carry your SunStash Max Solar Power Station. High quality loops and rugged double stitching mean this case will stand up to even the most rugged outdoors use! The 60W (16,000mAh) power stash rechargeable power pack is amazingly flexible. Powerful enough to charge all your gadgets (smartphones, dumb phones, MP3 players, GPS receivers, etc. ), it also has a high powered port that can charge higher voltage devices such as Laptops and 12v vehicle accessories that you already own (via the included Power Port Adapter). It can even charge two gadgets or a gadget and a PC at the same time! 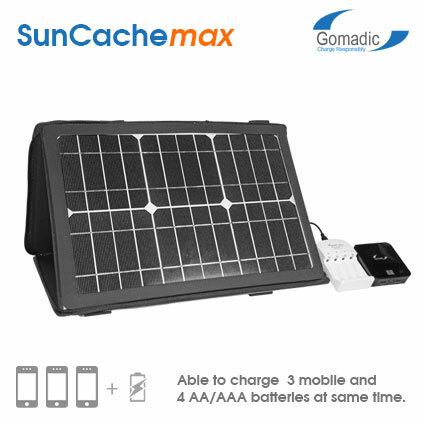 The SunStash Max battery pack can be recharged from either the sun or via the traditional power grid with the included AC adapter cable. Additionally, 10 different laptop connector plugs are included which fit the vast majority of modern day laptop PCs. In other words, we got you covered!